The number of 505(q) petitions that were submitted during the reporting period. The Agency reports that 763 ANDAs, 57 505(b)(2) applications, and three 351(k) applications were approved during FY 2017. Interestingly, there were no delays in approval for ANDAs or 351(k) applications caused by such petitions and only one 505(b)(2) application was reported as being delayed. The Agency reported that it received 25 505(q) petitions during FY 2017. 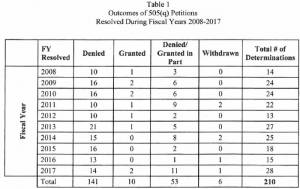 The chart below provides addition statistics on the petitions submitted since the reporting requirement went into effect. Because the statute requires FDA to prioritize responses to their petitions above everything else, the resources devoted to responding to them have an adverse impact on other work the Agency could have addressed even through there has been limited impact on the applications that were subject to the petitions. A complete copy of the report can be found here.